Tramways and LRT systems present a range of complex issues for designers, engineers, planners and local governments. By their very nature, most new installations are set in busy urban areas, and such locations offer conflicting demands for enhanced access to public transport while at the same time improving the visual appearance of our towns and cities. The electrification of tramway and urban rail lines can be especially difficult as these can be some of the most visually imposing rail systems. However, even the most demanding projects can be achieved through collaboration and clear engagement. The requirements and ambitions of the client, community and other stakeholders must be at the forefront of our thinking when designing a new system. Additionally, the new era of onboard energy storage can be used to supplement the portfolio of more traditional power supply systems to help deliver elegant, visually appealing system design that fits aesthetically within the existing civil architecture. This ethos must therefore also complement the stops and stations and other ancillary structures to create a comprehensive aesthetics masterplan for new designs. The old city of Bern is a World Heritage Site, but the city also has a comprehensive network of trams and trolleybuses using overhead electrification. Many of these lines pre-date modern aesthetic requirements, but when new lines are planned – or old lines renewed – sensitivity is required. Bern’s overhead lines are pole-mounted in outer areas, but to avoid clutter in the old city they are structure-mounted with span wires. As new routes have been installed, close co-operation with city planners, historians and civil engineers has been essential. Supports are sensitively located away from historic buildings and their positioning is designed to minimise visual intrusion. The ultimate outcome is that views of the Zytglogge are preserved, a local landmark maintains its cultural focus but enhancement of public transport provision is maintained. The 13.4km (8.3-mile) Limmattalbahn light rail route links the growing urban metropolises in the Limmattal Valley, stretching north-west of Zurich. Along with a requirement for elegant system design, as the route passes through urban areas served by different regional governments, the planning and design requirements were unusually complex. While a key consideration has been to minimise visual and environmental impacts, the entire route has been designed to project modernity to encourage further investment in the Limmattal region. Working closely with project architects, planners, local government and stakeholders, it was vital that local groups were engaged early. This – combined with significant efforts to streamline communication – has seen the best solutions developed and any residents’ concerns addressed before detailed design and construction began. Additionally, the Limmattalbahn contrasts the differing requirements of more densely built-up inner city and suburban areas. In the former, adjacent buildings and span wires support most of the electrification system, reducing the need for new structures that could clog busy streetscapes. The focus in such areas was to create equipment that is as small, simple and as light as possible, minimising or removing ‘clutter’. This also explains why a lower voltage (750V dc as against 1200V dc in the suburban area) was utilised in the busy city sections. Active transport elements – encouraging walking and cycling – are also critical to this project. For example, where space allows in outer areas, tree corridors have been planted to create segregated foot and cyclepaths; these corridors have been designed in-line with electrification structures in a cohesive masterplan, creating a compelling design. Yet while it is easy in any project to focus on the new infrastructure, it is crucial not to forget the existing environment. Here the removal of mature trees along the route would remove local landmarks so the decision was taken early to relocate them to form part of the design masterplan. The result is that replacement of these trees hides new electrical infrastructure and complements the planting plan. In conjunction with tree planting, the design of new electrification structures in outer-lying areas saw the development of an all-new type of structural mast. A full-size mock-up was created in early 2017 to give planners, architects, local government and residents’ groups the chance to see and feel the masts before the design was finalised. When ground-breaking began in August that year, everyone knew what to expect and continued engagement proved to be critical in meeting deadlines. The design features a streamlined tapered mast with a hollow box frame construction. The side facing the track has a recessed section with attachments for electrification equipment to keep it out of view. From the public’s perspective there are no visible bolts, just clean tapered lines. Additionally, special paint has been chosen to ensure the masts fit the surrounding environment in harmony with the tree planting masterplan. Recessed foundations and lighting removes the need for separate masts for electrification and streetlights. Tensioning equipment like counterweights are placed inside, also making these invisible. Rows of trees, in-line with the OLE masts, create a visual segregation and further minimise impact. The majority of tramway – and even some main line railway – depots are located within busy city environments. When Bernmobil designed its new Bolligenstrasse facility, it was aiming to make a visible statement about the network. 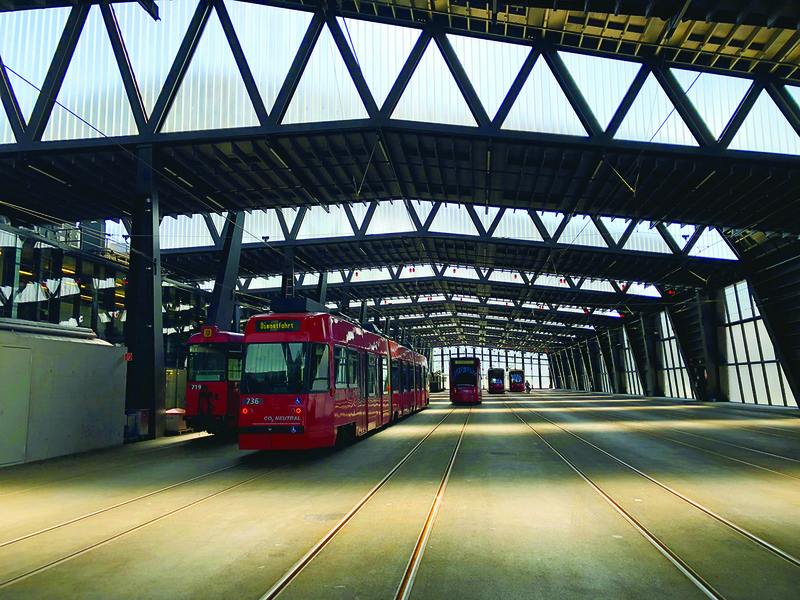 A sleek modern depot design was chosen and, unusually, the operator wanted large windows so the public could see inside to better integrate it as part of the community. It was essential therefore that both the structure and the electrification equipment inside it fit this look and feel. We adapted the StB-FL 100 light rail design to suit these requirements. No structures were used to fix the overhead equipment, with the system entirely supported using span wires and special supports connected to the structure. To ensure electrical safety, three levels of insulation were used before connection to the structure. Advances in steel fabrication, combined with inspirational design, mean that station designs and refurbishments allow for an ever-increasing aesthetic focus. A recent renovation of the Salzburg Central station in Austria managed to retain its magnificent arched roofing that dates from 1908 while bringing natural light to the previously dark transit corridors. An extension to the station means that there is now a juxtaposition between the stylish modern and the historic original. For the electrification elements, the project’s architects wanted a system that worked seamlessly in both areas, so we developed a design using single structures with back-to-back cantilevers between two tracks with similar steelwork to the overall structure. A Rigid Overhead Conductor-rail System (ROCS) avoids multiple overhead wires and tensioning equipment and allows for lighter and smaller structures. All these factors combine to make the OLE design blend in with both the heritage and the future. Another such example is Berlin Hbf where we adapted overhead attachments to fix onto the structural columns in the station building. ROCS was used to reduce the number of components, again making the electrification system less obtrusive. Electrification designs have to move away from the typical ‘one-size-fits-all’ approach to one that supports site specific aspirations. As battery and onboard energy storage develops, a new era of opportunities also grows. Developments in the last decade mean that it is now possible to only electrify parts of a new route (i.e outlying sections) and use onboard energy storage for more sensitive areas. Under this approach it is crucial that the electrification is developed in tandem with the rolling stock, and careful calculation is required with the electrification system and battery capacity on a tram. It is also possible to combine this with depot charging to have onboard batteries fully charged before a tram even starts a route. Furrer+Frey has worked on a range of projects using battery technology around the world – from the Arctic Circle to Southern Spain – and careful planning is essential. As an example, understanding heating or air-conditioning loads, as well as route-specific detail, is critical. • Early engagement with local communities and groups ensures a design that people like. It also prevents costly rework. • Work with architects and design masterplans; electrification is too often an afterthought and can detract from designs. • Work with the environment, using colour and planting plans to support aesthetics. • Symmetry and regularity promote aesthetics. Structures placed at different distances can create walls of steel when viewed from a distance. • If using battery technology, begin calculations and planning early. • One solution cannot fit all environments; a balance must be struck between cost and creating an appealing design that improves the local environment. Article originally featured in August 2018 TAUT (968).